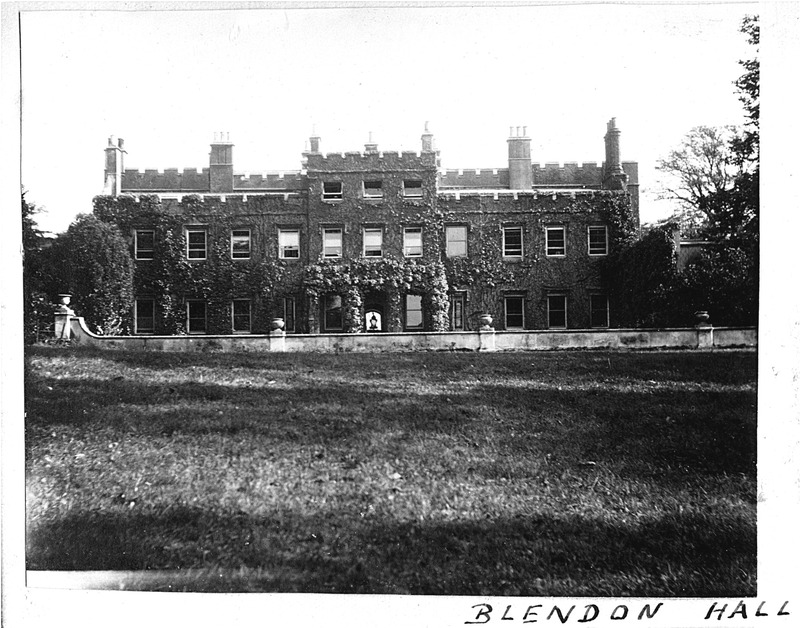 The August picture of the month is a classic shot of the western elevation of the Georgian hall at Blendon. It’s dated 1923. In the historical timeline the Hall will only stand for 11 more years. It will be mothballed for half of those years. The hall has now stood for about 160 years. The old building is fast deteriorating. No one in the Jay family wants to take on the onerous responsibility of this old, draughty mansion six years after this photo was taken. BAHRG’s extensive archaeological work has found intriguing evidence of counter-measures against serious subsidence. A dinosaur that’s outlived its time? A lonely old mansion haunting the further reaches of the fast developing suburbs? But this photo is not just a picture of an old building. It carries the distinctive hallmark of the photographer. Someone demonstrates an imaginative understanding of light and shade. They’re playing with us in their composition. It’s someone who isn’t afraid to experiment. Someone who wants to be different. Look in the entrance hall on the ground floor. There’s a bright light and an object. On magnification, it’s not a light. It’s a mirror on a stand. The mirror is angled so that you are directed to the porch lantern. The reflected light comes from the sky which provides the context for the lantern. Now look at the first floor windows. The central three windows are open with blinds shown in a similar way – highlighting the light theme in the image. There’s a crafted balance to this picture. On the right of the main building the photographer uses light so we see detail we cannot glimpse in similar images. The more you study it, the more you feel that this cleverly staged managed image has been created at a time of day and year to exploit the best of the available light. Who’s the photographer? Clearly they exert influence over the Hall owner. We think we can now attribute it. And it’s a she – not a he. Thanks to the recent visit of Margi Carlson from Olympia in Washington State on the west coast of the USA we now know who it is. Ettie Jay, the daughter-in-law of Mrs Jay, the last owner of the Hall. We can see Ettie’s fine visual talent with both people and landscapes in her photographs of her daughter and her cousin, the larger family and the general Blendon landscape. She uses water, light and perspective to great effect in her beautiful portfolio of images which has now come home to Blendon after 80 years of travel in Australasia and the Americas safely contained in a Blendon Hall black and gold lacquered box. Once again at Blendon, it’s a woman whose talent and character shines down through the years.